This blog post is a modified version of an email I sent to my subscribers. If you’d like to hear from me in your inbox, click here to sign up for my mailing list. I’ll also send you a free chapter from my forthcoming book, ACT On Your Business. I’m writing this blog post from my dining room table, feeling happy, proud, and a little tired. Because this morning, I ran New Bern’s Mumfest 5K race — my first race in almost two years. Running and I have a complicated relationship, which I wrote about a few weeks ago. I went from feeling like a strong, powerful runner who could accomplish anything, to feeling like a complete failure. Somewhere along the way, I lost the joy, and I stayed away from running for over two years. One thing I’ve learned is that when my intuition speaks, it behooves me to listen. So I took a deep breath, acknowledged that running felt scary and hard, and went for a run. I’m not going to lie – that first run was not pleasant. 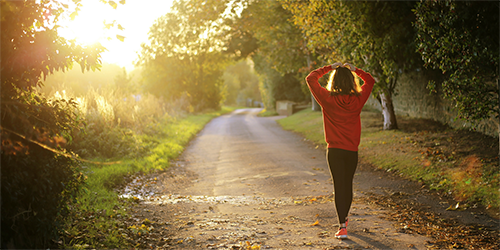 I ran 2.2 miles in 30 minutes, and at the end I felt slow, heavy, and discouraged. Until I realized… If I’m going to experience transformation, I have to start somewhere. In order to have an “after” picture, I have to have a “before” picture. That was run my “before” picture. So I am the kind of person who does best when she has a goal, and I knew a race would give me the motivation I needed to keep going. 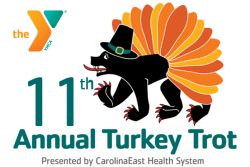 So I did some research and realized that there is a 5K/10K race in my neighborhood on Thanksgiving morning. My house is literally on the course, and the starting line is just a short walk away. I had no excuse not to sign up. So now I’m running a 10K race on Thanksgiving morning. New Bern’s town mascot is the bear, hence the logo. Which I love. As part of my training plan, I had a 5K practice race on my schedule. And I won’t lie – the thought of running a race made me nervous. The thought of going out there, in front of a group of people, and running… I could feel my stomach drop. I was scared of being slow. I was scared of being last. I was scared of not finishing. I was scared I’d embarrass myself. 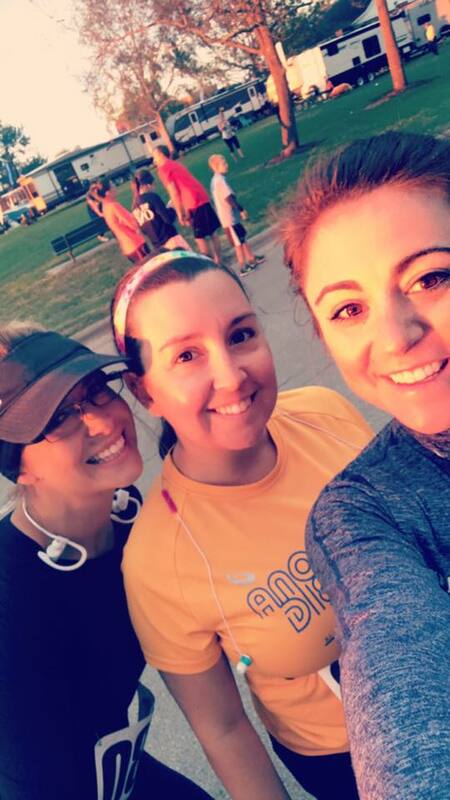 A pre-race selfie with my friends Tia (left) and Susan (right). I may not look nervous, but I totally was. The starting gun went off, and I began to run. And a few minutes into the race, I started to cry. It felt SO GOOD to be out there running — and racing — with other people through New Bern’s historic downtown. I felt connected to my community, and deeply connected to me, the old me, the one who loved running and felt strong while doing it. As I laughed and wiped my tears away, the fear I’d felt at the start completely disappeared. There was no time for fear. It was time to run. 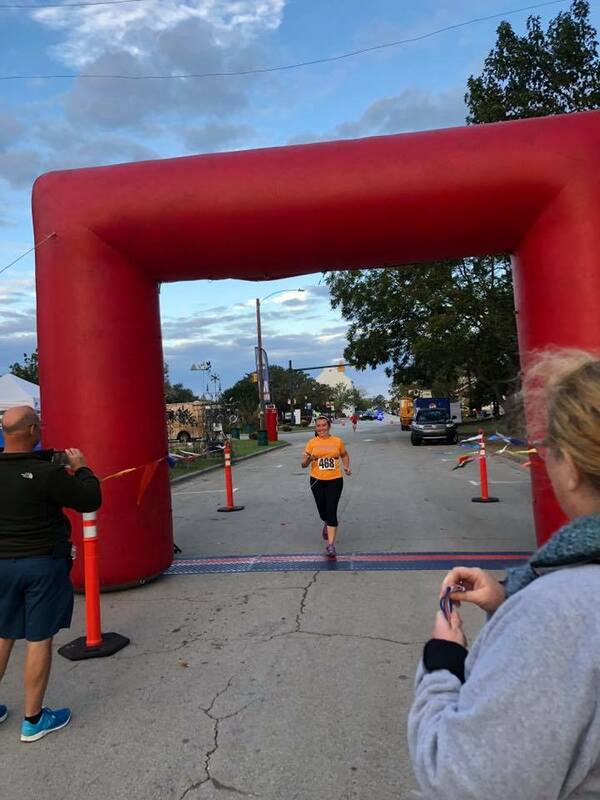 I thanked as many of the race staff, police officers, and spectators (all three of them – it was a small and early morning race) as I could, and I focused on bringing the joy to my run. People passed me, I passed people, but none of it mattered. I was just so happy to be out there again. As I approached the finish line, I picked up my pace, and I finished in under 34 minutes. My average pace was a 10:37 mile – faster than I thought was possible. And as proud as I am of that time, it’s just icing on the cake, because I had already won the minute the gun went off and I crossed the starting line. Hitting the finish line strong! So what are my takeaways from this experience? 1) You have to start somewhere, so start now. We all have a before picture, and they are supposed to be terrible, because they demonstrate just how far we’ve come. Make today your before picture. 2) Feel the fear and do it anyway. Don’t wait until the fear disappears to start, because it won’t happen. Make space for the fear, bring it with you on the ride, and see what happens. 3) Focus on the joy. This is simple, but not easy. It’s tempting to focus on the end result and allow it to define your experience. Instead, make the process the point and find ways to infuse joy in what you do. No matter the results, you will gain something simply by doing it. 4) Celebrate the wins, and keep going. I’m super proud of my race finish. But it’s not my “after” picture. This is a milestone in the journey, but the journey’s not over. Nor will the journey end when I run 10K on Thanksgiving Day. There’s always another experience to enjoy. Now, it’s your turn. Where are you at in your journey? Are you hesitant to start? Are you plowing ahead? Are you celebrating your victories? Share your story with me in the comments below, and tell me which of my four takeaways resonate most with you. And wherever you are, whatever you do, find a way to bring the joy.